Pizza is the best food on earth and nothing (NOTHING!) can change that — even though the stuff has long been vilified as a junk food because it's high in calories, saturated fat, and sodium. 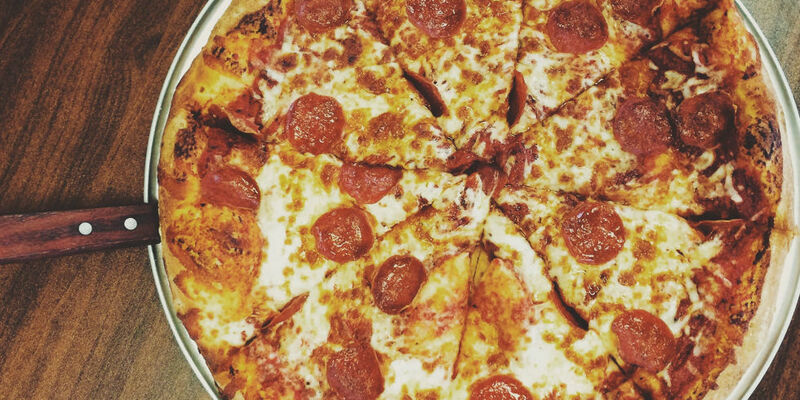 Spoiler alert: On average, a large slice of pepperoni pizza contains 311 calories, 13.5 grams of total fat (5.5 grams saturated), and 720 milligrams of sodium. And that's just one slice, which almost never happens. But before you go slice-shaming yourself, you should know what pizza actually does to your system, according to registered dietitian-nutritionist Sonya Angelone, a spokeswoman for the Academy of Nutrition and Dietetics. That's not to say drooling over said pizza is a total waste: Salivating triggers the release of digestive enzymes in the mouth, and they get right down to the business of digestion as chewed food travels from your mouth, down your esophagus, and into the stomach. Starting with the carbs in your crust, these enzymes begin to break your food down into super simple sugars known as glucose, which your body uses to fuel movement in your muscles, keep your heart beating, and so forth. But all of that comes much later. Before the sugar can hit your bloodstream full throttle (as it's inclined to do), the fat from the pizza's cheese and pepperoni tap the brakes to slow the surge. Because your body typically burns through carbs in a hot sec but takes its time to digest fats, high-fat pizza toppings help you reap more sustainable energy from your slice. (Bless you, pizza!) If you're especially sensitive to cheese or gluten, or you've eaten fairly quickly, you might develop belly bloating as your body continues to digest your food and release residual gases. Now that most of the carbs you've gobbled down are getting all up in your blood stream, your pancreas secretes the hormone insulin to help your cells sop up the sugar and put it to use as fuel. If your cells are already fully stocked (like after your third or fourth slice of pizza), they may reject the sugars, keeping your blood sugar levels higher for longer. Over time, high blood sugar can lead to inflammation, posing problems that range from cardiovascular disease to nerve damage, poor circulation, and various infections. (It's why eating a high-sugar diet can be dangerous — and why diabetes, a disease marked by high blood sugar levels, can be deadly when left untreated.) Eventually, the sugar will end up in your liver and be turned to fat. Meanwhile, your levels of leptin, a hormone secreted by your fat cells to squelch hunger and stop you from overeating, are steadily rising. Unless you've grossly overeaten, which can make you feel sluggish, you should feel fueled up. With food in your stomach, your body has stopped spewing out the hunger hormone ghrelin, so "Satisfaction" is your new middle name. At this point, the acids in your stomach are working hard to digest all the fat you've eaten. As soon as the fat is broken down, it's ready to be absorbed into the bloodstream where it will hitch a ride to your liver and either be rerouted to muscles to be used for fuel, or — if your muscles have enough fuel to do their thing — converted into fat cells for safe storage. This whole process only raises your levels of triglycerides (i.e., fat in your blood) temporarily. It's a good thing that they don't stay elevated forever: Persistently high triglyceride levels, which can be caused by a diet that's high in sugar, alcohol, or unhealthy fats (looking at you, pepperoni!) — can displace your blood's good cholesterol, ultimately clogging up and hardening your arteries. If you're overweight or you have a family history of circulatory disease, your triglyceride levels will stay higher for longer, so eating just one slice can increase your risk of conditions like a stroke and heart attack. A fatty meal (love ya, pizza) can make it harder for your blood vessels to expand, leaving less room for blood to flow and a residual increase in blood pressure. Because a high-fat diet can also promote blood clotting, this spells danger for anyone who heads over to Pizza Hut with existing heart disease risk factors (like a parent who's suffered through it). The good news is that your hormones — particularly leptin, which tells your brain you're full — have really gotten with the program, so the hunger pangs that made you order pizza in the first place have been put in their place. Unlike calorie-counters who scrap the cheese and meat off their pizza, you shouldn't start to feel sluggish at this point. Pepperoni and cheese provide fat and some protein to ground the body's surge of serotonin, a hormone that promotes sleepiness and tends to flow freely after you eat a meal that solely contains carbs. Hours after eating, your blood sugar has come back down to normal and the food has left your stomach — which could spark your interest in that leftover slice, or dessert if you ate pizza for an early dinner. Not everything is back to normal though — your triglycerides levels are still soaring. (It's one reason why you might want to make your next meal a salad instead of another greasy feast.) Unless it's time to tuck in for bed, schedule a snack or meal before your hunger hormone ghrelin, which is now free-flowing, sends you straight back to the pizza box for leftovers. That said, if you have unhealthy lipid levels, high blood pressure, diabetes, insulin resistance, heart disease, are overweight, or you smoke — conditions that already put your health on the line — then you'd be smart to lay off the pizza, or at least order a slice that's veggie-heavy and light on cheese.